I know that there are many of you out there who have been wondering why the hell it is taken me so long to create a template of the 737 MAX 9. After all, I’ve already done the MAX 7 and 8, so it seems logical that a simple stretch my existing templates wouldn’t seem like such a big deal, right? In theory, that is correct. There isn’t anything significantly different about the max 9 over the max 8 other than fuselage length (and a few other minor details), so what was the problem? 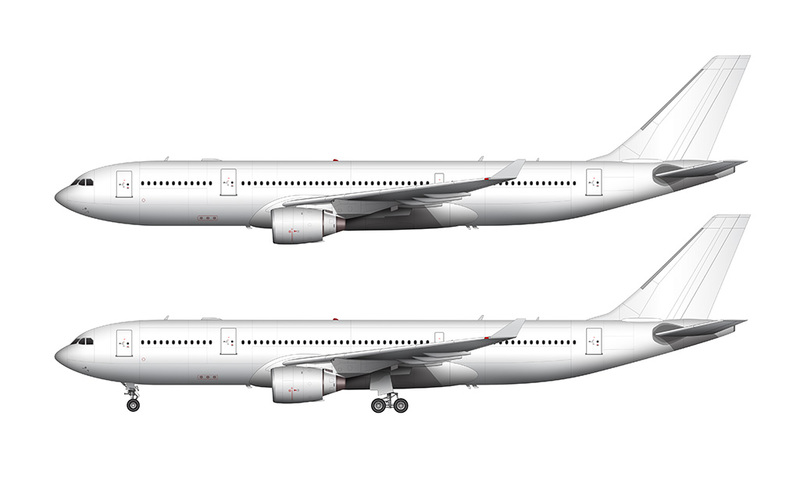 In order to answer that, I need to take you back to 2012 when I first started creating side view airliner templates. Back then, I really had no idea what I was doing, and I was just trying to figure out how to draw airplanes. The very first template I created was the McDonnell Douglas DC-10–30, and I followed that up quickly with the Boeing 737–800. I was a bit disorganized still, as I was so excited to draw those airplanes that I wasn’t really thinking about how to develop a process for creating these templates. Basically, that’s just a long-winded way of saying that my first templates were a bit rough and there were some unfortunate discrepancies between my line drawings and the fully rendered all white versions. 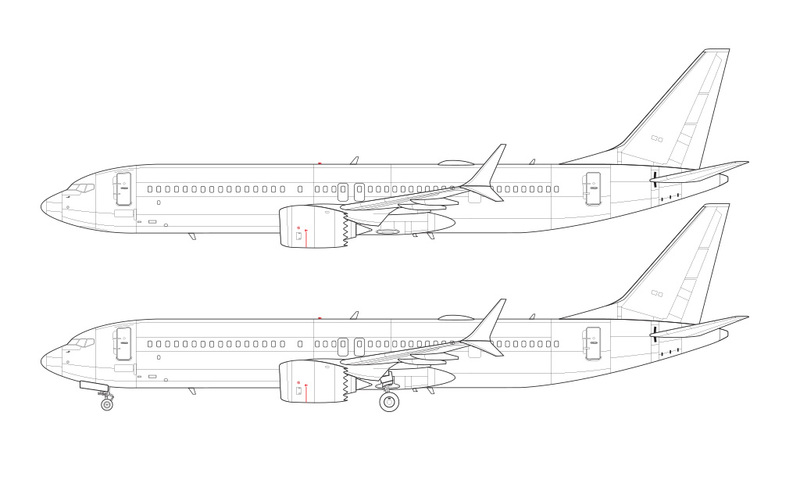 To make matters worse, I’ve based every single one of my 737 templates on that original 737–800 illustration. That means that all of those inconsistencies have been growing as I continued to build up my entire 737 series, and it has been bothering me quite a bit. You should all know by now that I am a total perfectionist, so before I could go and create new variants of the 737 (everything from the classics to the latest versions), I really needed to go back and redo my base 737 template from scratch. That’s what I’ve been working on in my spare time for the past few months. You probably didn’t even notice, but I have recently updated my posts about the MAX 7 and 8 with all new illustrations. And now that those have been updated, it allows me to post these templates of the MAX 9 without worrying that it would be inconsistent with them. This also means that I will be updating all of my other 737 template posts with updated illustrations (yay!). I don’t have an exact time frame for that, but I’m planning to have everything updated over the next few weeks. My best suggestion is to check back a month from now, and I can pretty much guarantee that all my 737 templates will be updated by then and you’ll know that you’ll have the latest and greatest versions. Those of you who have purchased the high-resolution source files on my online store will also have access to the new versions. You’ll get an automated email notifying you of the update as soon as it happens. Additionally, this also means that I am now able to start working on some of the 737 classics. 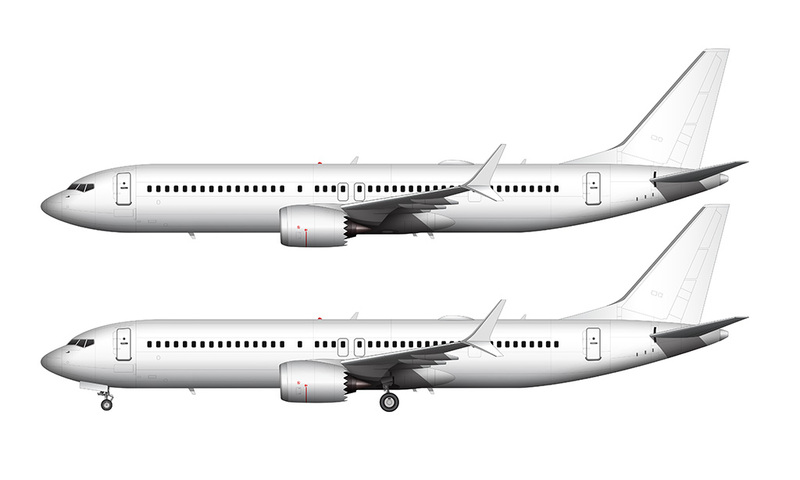 I’ve been holding off doing those for a very long time now because of how much work needed to go into fixing my base 737 template, but now I’m free to forge a head with those and eventually I’m going to have the entire 737 family of aircraft templated and posted here to the blog. I’m looking forward to that as much as you are! Haha! That’s a lot of pressure! I don’t think it’ll be coming next week but hopefully soon. Every time I upload a new template I always secretly wonder if you are going to like it or not. Haha! Glad you like this one! Great work as always, Norebbo! Can’t wait for A330neo! I was waiting for this forever! I will absolutely buy together when MRJ’s template is released!